Do you love strolling through markets, peeking at the merchandise and curiosities in stalls and searching for that special bargain or little treasure? These are Amsterdam’s best markets. Explore the largest outdoor market in Europe. Feel like a local when strolling around the markets. The absolute number one is the ‘Albert Cuyp’ market in the district ‘De Pijp’. It is the largest outdoor market in Europe. You can find anything from tropical fruit and fish to books and electronics here. The vendors are well known for their typical Amsterdam humor, which you probably won’t escape from. 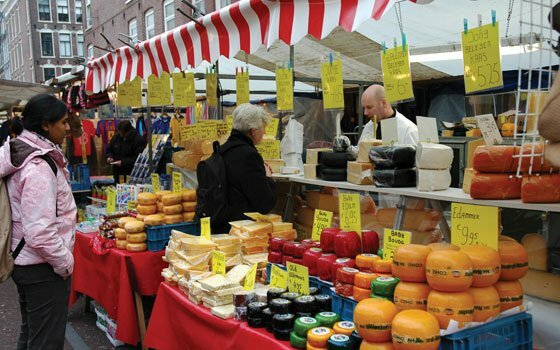 The Albert Cuyp market is open every day of the week except Sundays. The best flea market in town is located behind the ‘Stopera’ in Amsterdam. ‘Waterlooplein’ (Waterloo Square) is a flea market where you’ll find old records, old photographs, vintage clothes, secondhand sunglasses and many fun curiosities. The Waterloo market is open every day of the week except Sundays. Along a part of the canal ‘Singel’ is the famous flower market. All the flowers and other merchandise are displayed on floating barges. Daily fresh flowers are brought in from the surrounding horticultural areas. Most tourists buy tulip bulbs for back home or typical Dutch souvenirs at one of the many souvenir shops opposite the market. The floating flower market is open every day of the week. The ‘Noordermarkt’ is the neighborhood market ‘Jordaan’. The market is a mixture of a flea-, antiques-, ecological- and biological market. The atmosphere is always very relaxed. You can visit the Noordermarkt only on Mondays and Saturdays. With over 250 stands, the Dappermarkt offers a broad range and sells everything you can think of, from tulips to tuna and from taugé to textiles. This is the most affordable and multicultural market in Amsterdam. The Dappermarkt is held in the Dapperbuurt in Amsterdam Oost. The Dappermarkt is open 6 days per week. The largest indoor market in Europe is the Bazaar. It is a black market where you can find absolutely everything from furniture and electronics to fashion and cosmetics. Wandering through the Oriental Market it’s like you’re actually in the Middle East. The Bazaar is just outside Amsterdam in the town of Beverwijk. You can get there by taking a train from Amsterdam Central Station. The Bazar is open on Saturday and Sunday. Once a year, on the national holiday King’s Day, thousands of free markets are held throughout the Netherlands. The most popular free market is held in Amsterdam in the city park ‘Vondelpark’. If you are in Holland on April 27 you should definitely have a look.